- There are also Spell cards that give specific (magic) powers or bonusses to a ship, some of these spells and bonusses are focused on specific ships. There's still not a lot of info on the amount of impact theses cards will have on the game in its entirety. 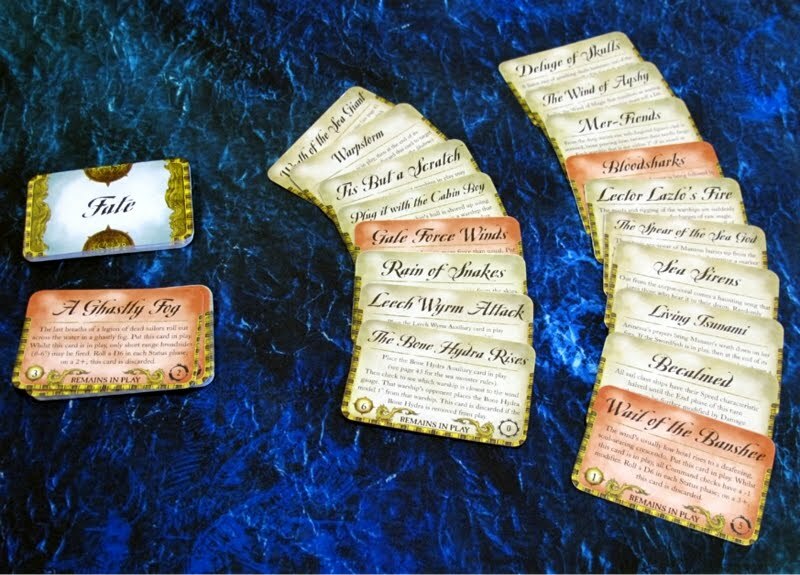 It would stand to reason that for smaller, early campaign games, only a limited set of cards, or at least excluding useless ship specific cards will be used. I defitinitely do wonder how this full pack of random effects will influence the later scenarios. Randomness certainly adds to replayability, but I also want to be able to have a fair chance at winning a game based on skill, rather than just lucky or unlucky dice rolls or pulls of random effects. And then we have the preview of the ethereal Shadewraith, which is a painting challenge I am certainly looking forward to! The ghostly colourscheme rather reminds me of the army/riders of the dead from Games Workshop's LotR range. 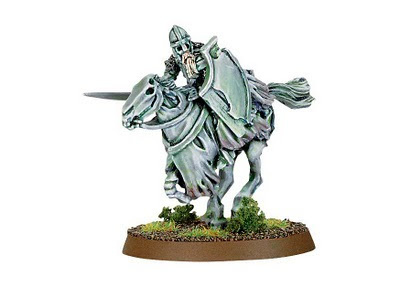 Rather fine minis, with a colourscheme I've always rather liked. 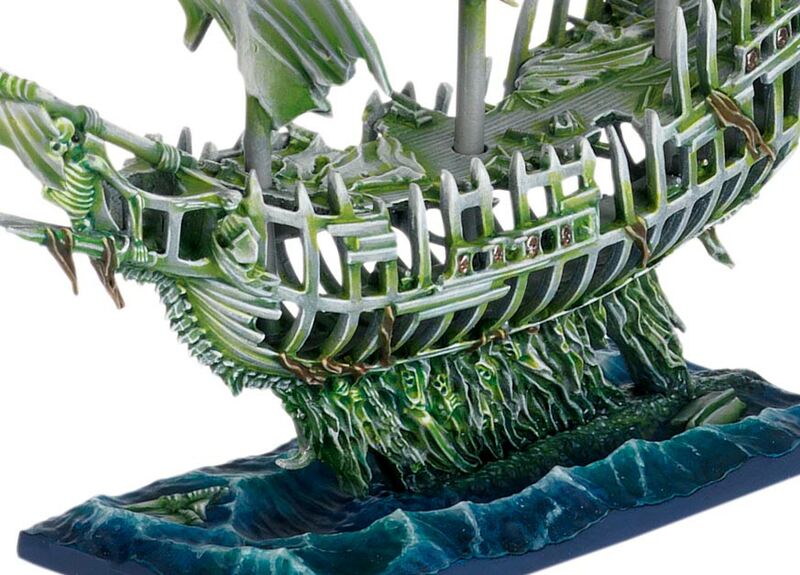 In all honesty I am mostly awed by the painting of the excellent sea bases that accompany each and every ship in the box. It's going to take a lot of work to even get anywhere near the standard of the promo pictures and realistically speaking it may be better, especially when used on a regular basis, to keep the sides of the bases plain black. Think I may need to grab my tube of wall filler, create a few sea-themed bases and see if I can get some nice effects going. In all honesty I'm getting rather excited about this release, though to be fair this is mostly due to knowing it will arrive in about 1,5 weeks at no cost. Were I in the position of still doubting rather to get it or not I'm certain the lack of coherent gamesystem info would still be irking me to no end. Still, for the time being, it seems like a most interesting approach to a spin-off game. The next update on this should be mid next week when the box arrives and a full unpacking will be in order. Though if GW posts more info on the game or ships I'm certain I'll find the time for some more musings on WHFB's newest push into naval warfare!